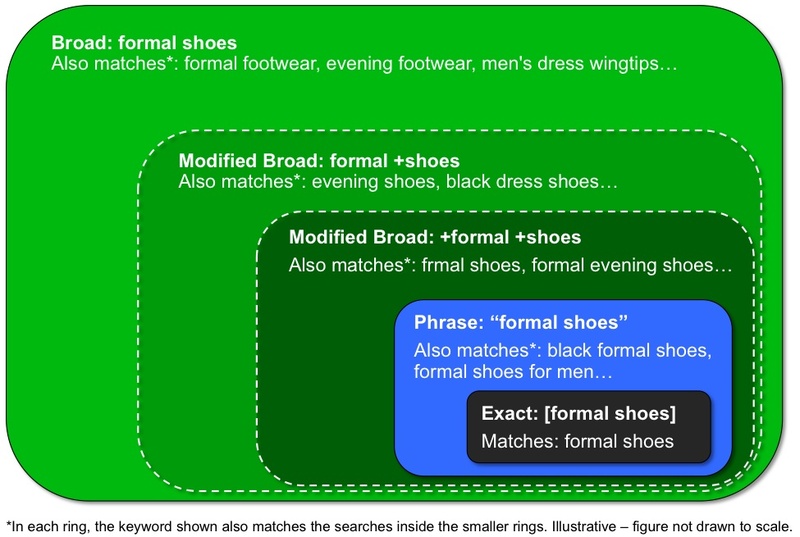 The broad match modifier is a new AdWords targeting feature that lets you create keywords which have greater reach than phrase match and more control than broad match. Adding modified broad match keywords to your campaign can help you get more clicks and conversions at an attractive ROI, especially if you mainly use exact and phrase match keywords today. To implement the modifier, just put a plus symbol (+) directly in front of one or more words** in a broad match keyword. Each word preceded by a + has to appear in your potential customer's search exactly or as a close variant. Close variants include misspellings, singular/plural forms, abbreviations and acronyms, and stemmings (like “floor” and “flooring”). Synonyms (like “quick” and “fast”) and related searches (like “flowers” and “tulips”) aren't considered close variants. The graphic below illustrates the relative reach of different keyword match type strategies. ** Be sure there are no spaces between the + and modified words, but do leave spaces between words. Correct usage: +formal +shoes. Incorrect usage: +formal+shoes. "We're always interested in ways to increase our volumes while keeping our CPA down. As a result, we've added broad match modified keywords to several campaigns where previously we only had phrase and exact match keywords. After a few weeks of testing, we're pleased to see these campaigns showed significant increases in conversion and volume, whilst keeping the CPA down. Therefore, we will be looking to scale our use of modified broad match keywords in all our campaigns to take full advantage of these great results." If you mainly use broad match keywords in your account, you should know that switching your existing broad match keywords to modified broad match will likely lead to a significant decline in your click and conversion volumes and will not directly improve Quality Score. To maintain volume, keep existing broad match keywords active, add new modified broad match keywords, and adjust bids to achieve your target ROI based on observed performance. You can begin using the feature by logging into your AdWords account, through the AdWords Editor and through the AdWords API. For more details, guidelines on usage, and answers to common questions, check out the original blog post and the AdWords help center. 1 Except Chinese, Japanese, Thai, Arabic and Hebrew languages, which are coming soon. We’ll update this post when the feature becomes available.